If you have been looking to get carpet installed in Rockwood, we have some good news for you. With The Carpet Guys at your side, you are provided with the absolute best carpet and flooring services available. 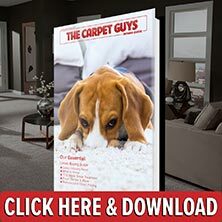 It should be fun and exciting when getting new carpeting in a home, and we have the finest carpet installers in Rockwood to make it that way. All the stress of buying new carpeting is taken off your shoulders. No matter what your flooring needs may be, get them taken care of with The Carpet Guys. Service from the best place to buy carpet is only one estimate away. When the installers arrive at your home, they can begin by removing the furniture from the room upon your request. After the room has been cleared, they can then rip up the old carpeting, wrap in into bundles, and place it outside by the curb. Once the old flooring is out of the way, fresh carpet padding can rolled out and the new carpeting is put on top and installed. The furniture can then be placed back into the room in the original layout, completing the install. Whatever your needs may be, get them handled by the best carpet installers in Rockwood. We are here to serve you.